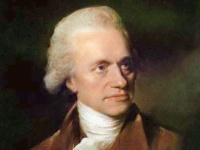 Distinguished astronomer William Herschel used a telescope he built himself to discover the planet Uranus in 1781, thus securing his place in history as one of the greatest astronomers of all time. His observations, and the telescopes that he built, doubled the known size of the solar system in his time. The telescope through which Uranus was first spied was built in the delightful Georgian townhouse that today houses the Herschel Museum of Astronomy. Visitors to the museum can view Herschel's workshop, as well as the original kitchen and the music room in the house where William lived with his sister, Caroline, at the end of the 18th century.